This week, we talked with three high school friends who have settled back in their hometown of Orlando, FL and are sharing the joys and challenges of motherhood and friendship together. Clarissa and Tiffany, both moms of 2 under 4, along with close friend Stephanie show us the power of finding supportive friends who back you up and help you out when you need them the most. Clarissa and Tiffany, what does the transition from not being a mom to being a mom feel like? Tiffany: Waking up after an all-night kegger—headache, exhausted, little queasy, disoriented, but oddly proud? Haha. Clarissa: Well, I googled "most extreme sport humans have ever done," and the result was Volcano Boarding. So, I'm going with Volcano Boarding. What roles have your friends played in your motherhood journey? Clarissa: Tiffany and Stephanie have been everything I would imagine biological sisters would be. They love me for my strengths and my weaknesses. I know that no matter what happens, they will love me through it. And, that is a really powerful thing. Tiffany: They are my tribe. My children refer to them as “Auntie,” and my kids know that whatever Auntie Clarissa/Stephanie says, Mama backs them up. So really, they’re backup Mamas! How have your friends influenced you as a mom? Tiffany: Clarissa is one of the best Moms that I know. Being around her and Jon with their children always amazes me, humbles me, and inspires me to be a better Mom. I’ve become much more aware of my sons’ feelings and journey because of them. Clarissa: Tiffany and Stephanie are both natural encouragers. Tiffany is a strong, loving mom and she amazes me with her dedication to her family and her kids. She is always doing fun crafts or field trips or outings with her little ones. She is always always always thinking about and doing things for others. Stephanie is one of the most empathetic and compassionate people on this planet. She sees the best in everyone, and she loves fiercely. She encourages me and makes me feel like such a good mom and she loves my little ones with all of her heart. She is loyal and strong and warm. Tiffany and Stephanie are here for me when I need it, whether that is hug, a shoulder, or a really good laugh. Stephanie, would you say you are also on a motherhood journey? Stephanie: I hope that they would agree with me saying yes, I feel that I am also on this motherhood journey. And, I feel like I am learning along the way. For example, Clarissa will call or text to me to discuss a new situation she is facing with one of her children, and together we discuss how to handle it or proceed. I am also getting to share in all the little moments like potty-training and walking and celebrating all these achievements. Even though these are not my own children, I am filled with such love and pride and protection for them. Clarissa: In the throws of motherhood and life, a great deal of comfort comes just from knowing that if/when you reach your limit, someone is there. Sometimes that is enough to keep you going and sometimes it allows you to get the help you desperately need. Our friendship makes me stronger, but also allows me to be weak and scared and nervous and tired. Tiffany: The cliché “it takes a village” is one of the most honest truths I’ve experienced after becoming a mother. From family dinners to stepping in when someone needs an extra hand or help, our “tribe” is always there for each other. It’s an honor and privilege to have these true friendships. Stephanie: We are there for each other whenever the other needs it most. We know we can also ask one another without hesitation. What is your favorite thing about sharing motherhood with two close friends? 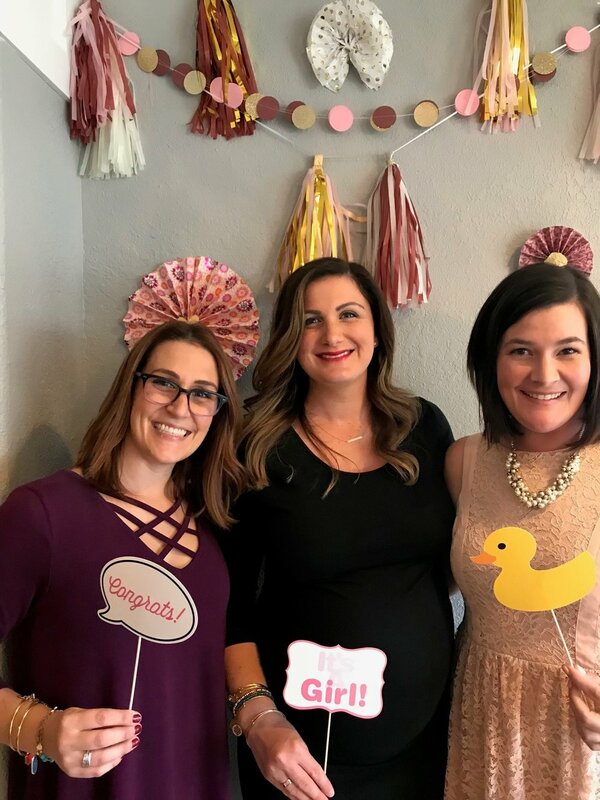 Stephanie: I love that my friends are willing to share their motherhood with me—that they are willing to share this intimate experience with me. I feel so lucky. I am honored by the trust that they put in me and am overwhelmed by the love that I get to experience with their children. Clarissa: The best part is that they both knew me before I had kids. I don't have to "mom date" them—is that the term?—because our core friendship is so deeply rooted. We can feel comfortable disagreeing about parenting hot topics and we can feel comfortable being vulnerable. It is easy to turn to Steph and Tiffany and lament the 20lbs I need to lose, complain about a perfect mom I found on Instagram, or text a picture of my toddler's poopy diaper. I will always find a supportive, loving, and sometimes funny response from these wonderful ladies. I never have to prove that I'm skinny enough or pretty enough or put together enough. They love me no matter what. Tiffany: I think that having someone just to lean on and to say “oh yeah, I’ve been there” is comforting. Do you have any words of inspiration you live by to share or advice for new parents? Tiffany: “We rise by lifting others,” Robert Ingersoll. For new parents, trust your gut and realize that what one parent’s power is may not be yours, and that is okay. Make the most of your talents and knowledge, but never be afraid to try and learn new powers. Clarissa: “If you want to bring happiness to the whole world, go home and love your family,” Mother Teresa. And, give yourself permission to change your mind. Give yourself permission to take a break. Give yourself grace. You'll make mistakes, and that is okay. Stephanie: “The bond that links your true family is not one of blood, but of respect and joy in each other’s life. Rarely do members of one family grow up under the same roof,” Richard Bach.